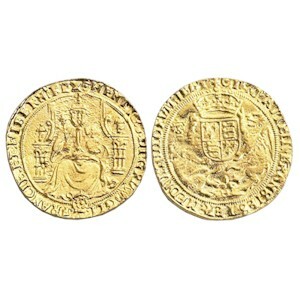 Obverse: Henry VIII enthroned holding orb in left hand and sceptre in right hand. Throne with curved sides, rose at feet. Text around HENRIC 8 DI GRA AGL FRANCIE ET HIBERN REX. Reverse: Crowned coat of arms shield with Fleur De Lys in first and third quarter and lions in second and fourth quarter. To the left a lion and to the right a dragon support the shield, HR in cartouche below, trefoil stops. Text around IHS AVTEM TRANSIES PER MEDIVM ILLORVM IBAT.